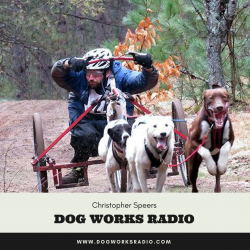 Join host Robert Forto as he welcomes musher, Chris Speers to Mushing Radio. Speers is gearing up to travel to Poland in November to race in a drylands race series for the United States. Christopher Speers is from Indiana and currently has four dogs and has been drylands racing since 2011. He primarily runs in the four dog rig class and occasionally bikejorring, along with 4 dog sprint sled racing too. Prior to racing sled dogs he lost 100 pounds to become the best that he could be for his dogs. Diet and exercise, along with hard work and determination and a lot of sweat has helped Speers reach his goal. Speers is currently on the USFSS National Team for Canicross and will be competing in Poland at the 2017 IFSS Drylands World Championship in November. I hope that I can inspire others to be more active, even if its not with their dog, and not necessarily to my extremes.